BHG is sending one lucky couple on a once-in-a-lifetime dream vacation to the beautiful Cook Islands including 2 nights accommodation in a Premium Beachfront Bungalow at Pacific Resort Aitutaki on the island of Aitutaki and 3 nights accommodation in a Beachfront Bungalow at Little Polynesian Resort on the island of Rarotonga. Plus, the winner will also receive $10,000 in cash which may be used for additional travel expenses. A grand prize valued at $16,950. You can enter this BHG Sweepstakes at any of the following websites: www.bhg.com/cookislands, www.marthastewart.com/cookislands, www.shape.com/cookislands, and www.marthastewartweddings.com/cookislands. Who Can Enter? The BHG Dream Vacation At Cook Islands Sweepstakes is open to legal residents of the 50 United States and the District of Columbia, 21 years of age or older. When To Enter? Sweepstakes begins at 12:01 a.m. CT on 2/21/18 and ends at 11:59 p.m. CT on 6/30/18. 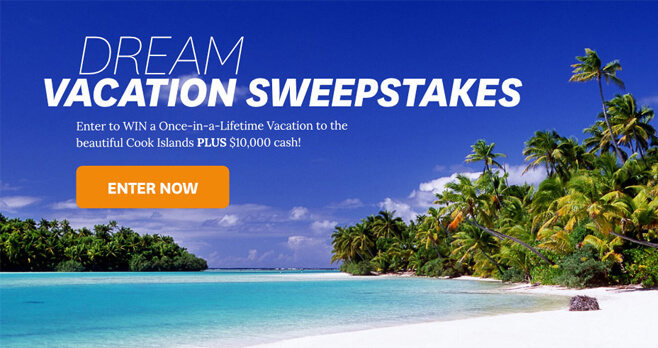 What Is The Dream Vacation At Cook Islands Sweepstakes Prize? The Grand Prize consists of a trip for winner and one (1) guest to the Cook Islands. The prize will also include a $10,000 check, made out in the winner’s name, which may be used for additional travel expenses.